Growing up, I always had an enthusiastic love of reading. Self-taught at four, my parents didn’t even believe I could read, and instead assumed I had deftly memorized the books they read me so often. Challenged to read from the newspaper, I stunned them all by reading straight from the page. Then came school, and reading for fun quickly fell out of fashion. I was required to read so much that the thought of adding extra “work” voluntarily seemed silly. So I took a two decade long hiatus from my hobby. Through high school, college and graduate school, I read what was required of me, no more, not much less. After grad school my brain was broken. I had used up too many brain cells digesting the works of Foucault and Aristotle, Kenneth Burke and bell hooks. Some loved, some….not so much, but brain cells just the same. I needed a BREAK. So I bartended. I went out at night. I spent lazy days on the beach flipping through magazines. I rode my bike wherever I could as much as I could, especially on the weekends when I made it a point to not get in my car unless it was absolutely necessary. I found myself riding my bike past a huge, beautiful library, both inviting and intimidating at the same time. On a particularly hot day I decided to go inside even if it was just for the cool, yet musty, air. I walked the aisles, my hands gently touching the spines of the books. Always a tactile person, the idea of reading a book any other way was borderline offensive. The smell, the feeling, the colors of the books called me in a way I couldn’t resist. It was in this newfound sanctuary that I once again began to consume books. I didn’t just read, I ingested them quickly and completely. I found myself returning to the library weekly, checking out books and predictably sitting under some large tree to read and relax. That year, I began tracking how many books I read, and was both pleased and surprised at my final total of 56. For a single twenty-something with a not completely pathetic social life I thought I was doing rather well. I kept this pace up for several years. Then one day, I was told that I should say goodbye to this passion of mine. See, I was going to have a baby, and there’s no way I could possibly still have time for such things. “You’ll see,” they said. “Just wait,” they said. I was momentarily dismayed by this warning. Then I remembered that I’m incredibly stubborn and I LOVE proving people wrong. My son was born in June 2013. That year, I read 56 books. Did these naysayers miss the part where I’m incredibly stubborn? Or where I LOVE proving people wrong? My daughter was born in December 2014. That year I read 57 books. 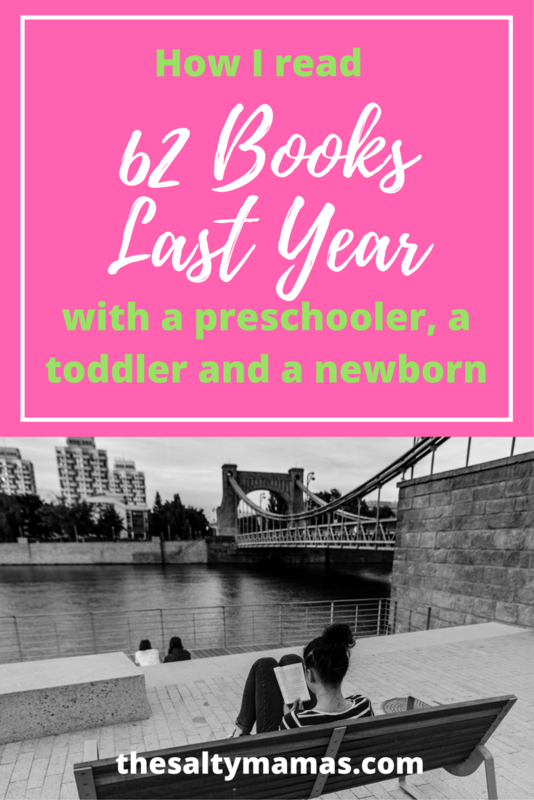 In 2015 – the year where juggling two babies AND books would be impossible….53 books. My secret is simple: I’m a reader. It’s a HUGE part of who I am. It’s a huge part of me that I want my kids to see. It’s a huge part of who I want my kids to be. Sure I have little tricks….I bring a book everywhere I go. EVERYWHERE. In the first year of a kids life, there are lots of Drs. appointments. I bring a book. Kids fall asleep in the car and it’s just easier to turn that into naptime instead of praying that you can transfer the baby to the crib. I bust out my book. Middle of the night feedings? Pop my reading light on my book. Chad and I go on a date? Yeah – I bring a book. You never know when he might disappear for a questionably long trip to the bathroom. And if he does? I read my book. We also have a wacky “no electronics in the bedroom” policy – I’m sitting out on the couch in our living room as I type this at 3am because the baby woke up and I can’t sleep – so I read in bed every night. This has rubbed off on my kids, often asking if they can bring books places. My daughter keeps a small stack in her crib. My son, a basket at the foot of his bed. The baby currently has patience for tiny board books with about 4 pages and 12 words, but I haven’t given up on her. My heart absolutely swells when I see this part of me manifested in them. But more than anything, it’s keeping a bit of me from before kids. Along this road I’ve lost so much of who I was to be who I am now. And I love being a Mother, don’t get me wrong. But I also love just being a woman, getting lost in a good book. How I found time for ME as a Mom, doing something I loved – and why it was so important. When did I stop consuming books like a powerful fire? It’s so sad. I maybe read eeek, 6 a year ( hangs head in shame) I gotta get back at it, after all it is intensely enjoyable. Honestly I think a huge part of it is our phones and all the other options – that are appealing, but I feel so much better when I choose a book! You are so right! Its the freaking phone!!! I am 100% with you! Books are who we are, too. I don’t read 56 books, maybe a dozen a year, but that includes nonfiction, which I read slower. If I was on my computer less, I’d definitely read more! Hey, whatever works for YOU ? I’m a reader like a bear is furry. I’m currently a member of 4 separate book clubs! I have six kids but I’ve never counted my yearly total….. but with at least 4 every single month (though I’m typically also reading one of my own choosing) I’m guessing at least 48! Not bad. Awesome! I track mine on Goodreads and it is pretty easy ? I’ve been wanting my little one to have many books so he can read for fun and create a good hobby and the best way to do that is to lead by example and you’ve proven that. Your book count is impressive! ?? I really should read more but my brain is SO TIRED. I find i just want to veg out. I do read on my phone as a result of one handed nursing, but there is nothing like an actual book. I think I’ve read maybe five books this year. I recently set up my amazon kindle unlimited account, so that I can receive free amazon books on my tablet. Loved this!! I used to read sooo much before I had my son. I’m an avid researcher so I still do that but it’s been a while since I sat down with a good book! I am finally getting back into reading because I missed it SO MUCH. And you’re so right. I want my kids to see me reading! I should really read more. I just never know what to read! !